The haunted Menger Hotel has been deemed as one of the scariest places in San Antonio, Texas. If you are searching to experience a literal mausoleum of ghosts, this haunted hotel is the place to be. On the 1st day in February in the year of 1859, a man by the name of William Menger opened this lavish structure as a hotel to the public. It was built on the same grounds as the ever-popular “Menger’s Brewery”. It was a fine hotel that hosted highly popular guests like Babe Ruth, Eisenhower, and several others. Today, the fine hotel seems to host spirits of individuals who simply find it hard to leave the structure. Here, you will learn some interesting facts regarding this haunted hotel. The haunted Menger Hotel has a number of stories to tell, and the spirits to prove it! The first spirit that we will discuss is that of a maid that worked at the luxurious hotel. This maid was named Sallie White. Ms. White thoroughly enjoyed her position at the hotel and provided excellent service to the business. She was well loved by both the individuals that she worked with, as well as the customers of the hotel. Unfortunately, the one person who should have loved her didn’t. That was her husband. He murdered the lovely lady. The hotel took on the expense of burying her. Today, this dedicated lady can be seen walking along in the hotel in the evening and night hours. Generally, she looks as if she will deliver towels, but never accomplishes her task. There is a very interesting spirit that is often seen in the area where the lobby originally was at one time in the hotel. This spirit is a lady that simply sits knitting something. She is wearing a blue dress that seems to be from an older time period. She also wears small, metal glasses. She does seem as if she is an intelligent haunting, but not a very friendly one. Employees have asked if they could help her, or get her anything in particular and she always answers with a firm and rude “no”, then she simply disappears in front of them. It is unknown who this lady may be, but her spirit is definitely attracted to the area that she is seen in. There are a many individual spirits that seem to haunt this hotel. Each seems to compete with the other for the proper amount of attention. In some instances, items in the hotel will move by themselves, and in the kitchen, things have appeared to literally “float” in the air. Many individuals have claimed to hear voices and even laughter when there is absolutely no one physically there. If you want to experience the spirits of the haunted Menger Hotel you can! 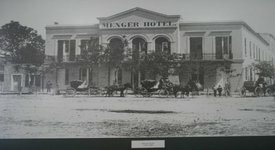 Check for the lowest price, get directions, view photos, and read the reviews and traveler tips for the Menger Hotel.